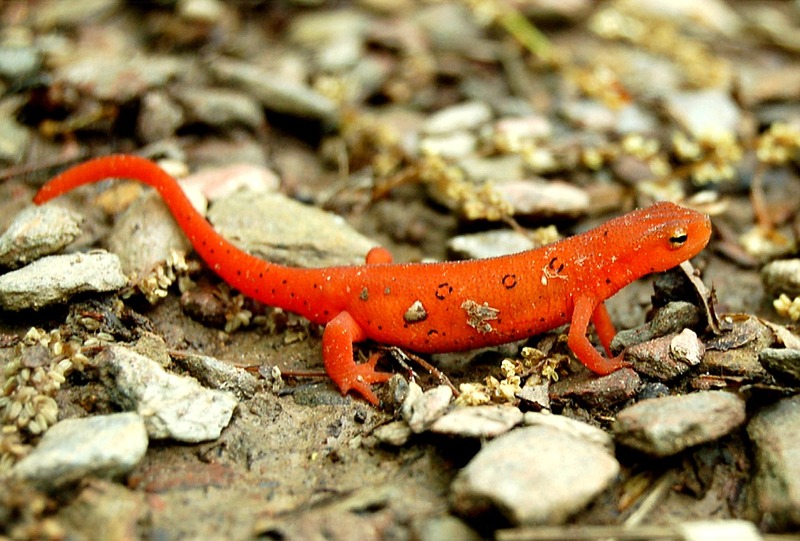 Everything about salamanders is lonely: their loose, soft reddish-yellow bellies hanging low over the ground, their four-toed forelimbs planted firmly in the leafy, stick-encrusted soil. They never dart across the forest floor with a lively, frightened step. The most they will maybe do is turn their blank heads and breath on you a little. They are a lonely profession. Every day I go down to the little hillock, where, on the far side (the soil is moist because of a nearby bog), I push the crumbling logs aside and get down on my knees and gently observe these timid amphibians, taking careful notes in a small spiral-bound notepad. It would be too much to give these creatures names. I might as well name the bends in a road, or the local divisions of air. The notebook is flimsy and weak, the pages rip out easily, and if I really want to get any work done I have to set it flat on a rock, or, better yet, retire to my verandah, where I recount the activities of the salamanders in much greater detail than if I was actually there. “Specimen 27M is reading Tolstoy–his masterpiece, War and Peace. Specimen 83F is impressed. 83F feels an affinity for the Russians, and would like to read Tolstoy, but so far she’s only read The Death of Ivan Ilyich, as well as Crime and Punishment and The Brothers Karazamov, by Dostoevsky. “‘In fact, I’ve read The Idiot,’ he says. “‘Oh, and how did you like that?’ asks 83F. Since none of the salamanders have names, neither 83F or 27M really exist. Furthermore, the activities I have attributed to them would be impossible for them to ever perform. Salamanders do not have the sufficiently advanced mental faculties required to appreciate great literature. But I believe that regardless, when I’m on the verandah writing I come to an ideal of salamanderness, that, even though it is not explicitly factual, is true because it is learned from watching their daily movements and non-movements.